Congratulations, you’ve made one of the best decisions of your life – to pamper yourself with an inflatable hot tub. The advantages of having a spa available at home are many, from relaxing tired muscles after a taxing day, either on the home front or at work, to the sheer fun of sporting with family and friends on the weekend immersed in thousands of heated bubbles with a refreshing drink in your hand. 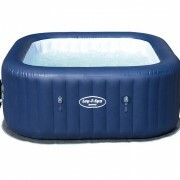 An investment in your own inflatable hot tub can feel like a mini-holiday without leaving the house. 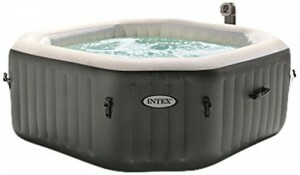 When you add up the advantages of a tub, including portability–you can use it indoors or outdoors; you can move it from deck to garden depending on your whim; and the price compared to traditional in-place hot tubs, it’s easy to see why such a purchase is less an indulgence than a wise, long-term investment in health and entertainment. 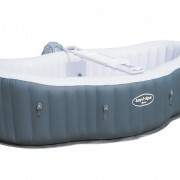 What does it take to set up this inflatable, portable hot tub? 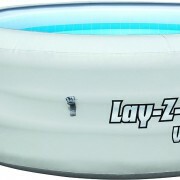 A minimum flat space to accommodate the 1.80m x 65cm (71″ x 26″) footprint, access to running water and electrical power, and a desire to indulge yourself in 40C (104F) water pulsating with the Lay-Z-Massage Jet System, loosening those tight knots around your neck and shoulders. What better way to relax and unwind than in your very own blow up tub? But let’s take a lo ok at the main selling points of this fully functional model that comfortably fits 2 to 4 people. Perfect for singles or small families with limited space, you can place your Miami spa almost anywhere–the patio, the garden, the deck, even the indoor family room or bath, anywhere couples and families like to relax. 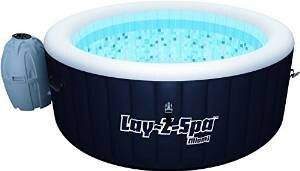 Easy to assemble in minutes by connecting the hot tub to the pump heater unit, included in the box by the way, then simply turn on the air blower. Inflate, connect the pipes and fill it with water, which reaches its maximum temperature through its rapid heating system. Adjust to your desired temperature with the digitally controlled heater pump, which also regulates the force of the impressive all surrounding Lay-Z- Massage Jet System for a gentle, relaxing massage or a vigorous blast of water. Of course, nothing in this world is perfect. The instructions don’t make it clear you must run it through an RCD IP66 outside socket. Though a small number of reviewers had quality issues, almost two hundred users gave this model five stars. Quite a vote of confidence in value and quality. Now for you techies, here are the specs. Rapid Heating System: Approx. 1.5-2.0C/h (3-4F/h)Max. 1 x Setup / Maintenance DVD. Now let’s look at our second contender. Not all spa lovers are created equal. Some investors in a home hot tub want hydrotherapy with their deep heat soak; others are happy with bubbling water. The difference? To put a fine point on it, when a tub contains air jets, or micro holes, all around the perimeter in the base of the spa, they create bubbles in the water that rise upwards for a pleasant and relaxing experience. When water jets are positioned halfway up the side wall they can provide some hydrotherapy. In other words you can position your knotted muscles directly in the path of the pulsing jets of hot water for a massage, rather than have the hot water merely swirl around you. Both offer a delightful experience, but you need to be clear about what to expect. So what are the high points of the PureSpa tub? Let’s go down the list. One aspect of a home hot tub spa purchase that can give the consumer pause is the prospect of hours of complex installation. Not to worry with the Intex PureSpa. It doesn’t take rocket science to set up the PureSpa. Its user-friendly interface and easy set up guide is designed to get your home spa up and running in minutes. Maintenance is just as easy, with replacement filter cartridges to keep the spa free of algae and the water clear and refreshed for a continuous enjoyable spa experience. With the touch of a button, a user friendly control panel operates water temperature and controls the high performing bubble jets surrounding the interior of the spa for a refreshing massage. The heating system adjusts to your personal temperature preference allowing a stress free spa experience. You want bubbles for ultimate relaxation? How about 120 high-powered bubble jets to melt away your stress? Concerned about quality? The PureSpa’s Fiber-Tech TM construction offers the ultimate in comfort and support. Do you have pets with sharp claws? Or small children who run around with point objects that might poke a hole in inflatable materials? Not to worry. 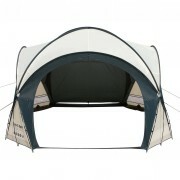 The PureSpa construction includes puncture resistant 3 ply laminated fabrication. We like the insulated cover to prevent the water from cooling off when not in use. 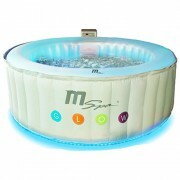 Though the PureSpa heats up quickly, you want what you want when you want it, right? And that means a hot tub should be hot on order. So the insulated cover is a real bonus. Yet with all these features, the PureSpa comes up short for many customers on quality and ease of use issues. Buyers have complained that they run through filters at a higher than expected rate and feel they don’t get their value for the money. It’s fun while it works, but it’s noisy, and for some, not dependable.